William J. Bredenberg Financial Advisor, Buffalo, NY William J. Bredenberg – Trubee, Collins & Co., Inc.
William J. Bredenberg joined Trubee, Collins & Co., Inc. in 1986 as a Financial Advisor, and is a Vice President. 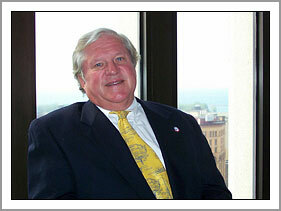 A graduate of Hobart College, Bill has been an investment advisor in the Buffalo area since 1972. He focuses on determining and establishing workable financial strategies for his clients; of primary concern are wealth building, retirement planning and ease of estate transitions. Bill holds the following industry-related licenses: General Securities — Series 7, General Securities Sales Supervisor — Series 8, General Securities Principal — Series 24, Uniform State — Series 63 and Investment Advisor — Series 65 licenses, as well as Life, Health and Variable Annuities licenses. Bill is an avid sailor and previously served as Commodore of the Buffalo Yacht Club. He is a past-President of the Bond Club of Buffalo, past-President of the Rotary club of Hamburg, former member of the Firm’s Board of Directors, former Secretary to the Firm’s Board of Directors, and former Treasurer at the South Wales’ GOW School. During the winter months, Bill is an equally-as-avid skier and can be found on the hills of Holiday Valley with his wife, Barbara. They reside in Hamburg with their beloved dog, Hinkley, and take every opportunity to make their way to the Western United States to visit their adult daughters: Molly and Kary.